Xavier debates Senator Kelly & Graydon Creed on live TV. 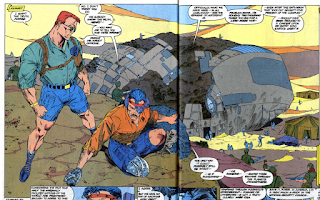 In Kuwait, Forge and Gyrich inspect wreckage which Forge determines to be the remains of Asteroid M, and inside, they are stunned to discover Magneto's body missing. 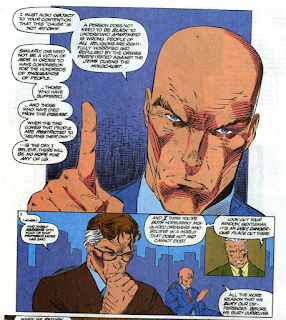 In New York, Jean helps Professor X prepare for a televised debate on human/mutant relations with Senator Kelly, while Archangel checks on Teddy, the young boy recently targeted by the Acolytes. Xavier & Kelly are joined by Graydon Creed, leader of the anti-mutant Friends of Humanity organization. Watching the broadcast with his fellow Upstarts, Cortez is incensed that Creed is a member of the Upstarts. 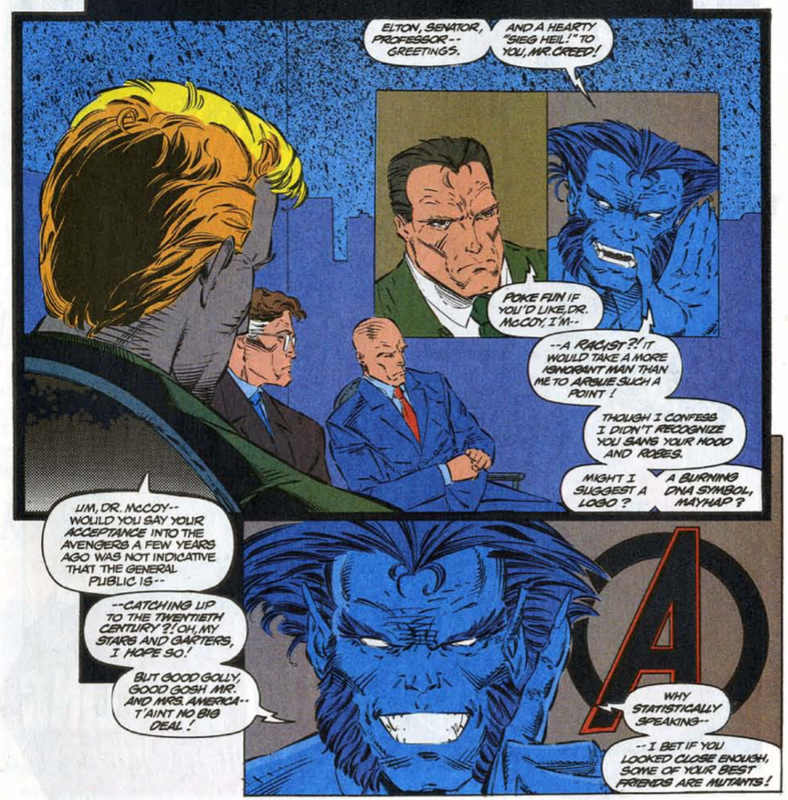 Shortly, Beast joins the televised debate, and quickly gets under Creed's skin, much to the delight of the X-Men watching from Harry's Hideaway. As the debate concludes, Xavier finds he and Kelly have more in common than they thought, a sentiment similarly expressed by Kelly's telepathic aide. 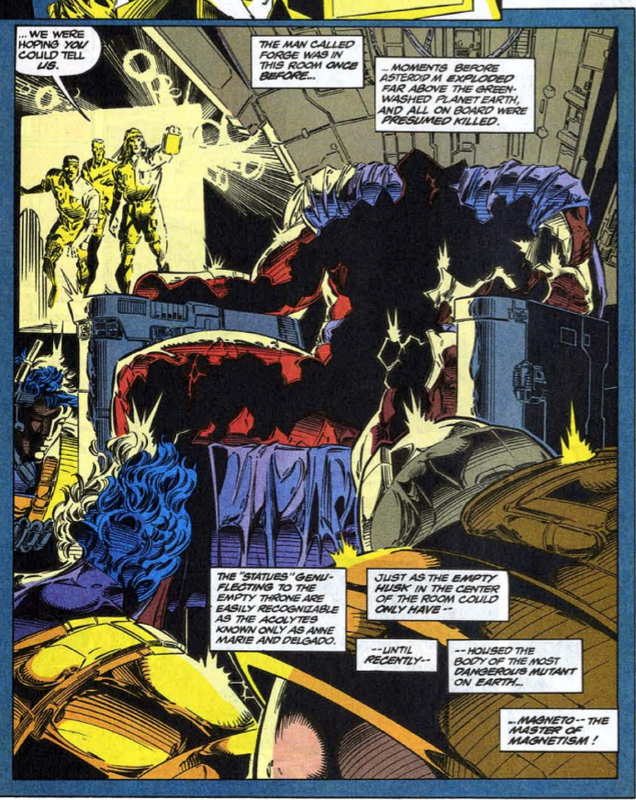 Outside the TV studio, Cyclops tells Xavier that the Blackbird is ready to go; the Acolytes have been traced to France, and the X-Men are taking the fight to them. 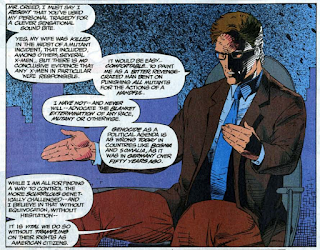 Graydon Creed, who previously appeared in Stryfe's Strike Files, makes his first in-story appearance this issue, appearing as the anti-mutant pundit on a televised debate. Along with Creed, his organization, the Friends of Humanity, is mentioned for the first time. Both Creed and the Friends will play a significant role in the franchise over the next few years (and are also heavily featured in the early seasons of the animated series). The Upstarts make something of a return this issue, with Shinobi Shaw, Fitzroy and the Gamesmaster all returning. 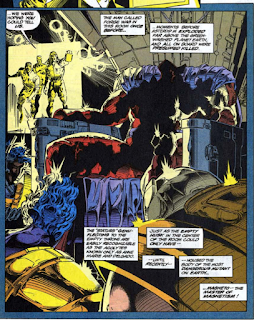 It's also revealed that Fabian Cortez is a member (something else previously established in Stryfe's Strike Files), as is Graydon Creed, something which bothers Cortez (due to Creed being human and anti-mutant). 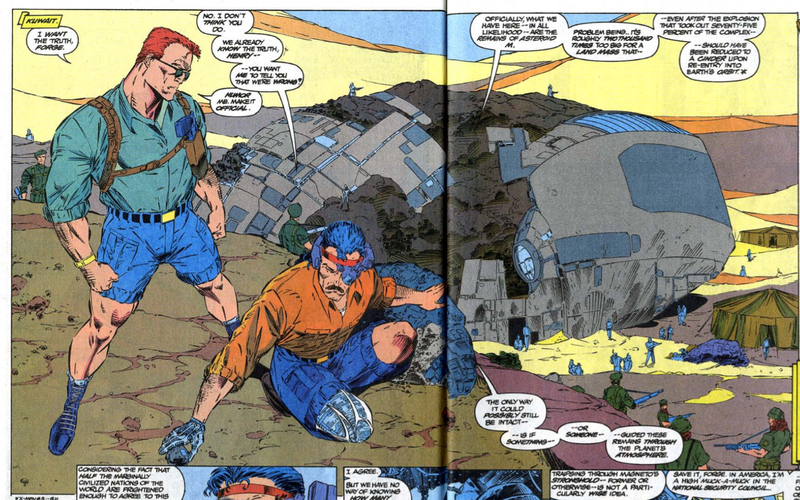 I also love how clearly tired Shinobi & Fitzroy are of Cortez bragging about killing Magneto. In the process, we get something of an origin for the Upstarts (they're bored and this is a way to have some fun), and another take on what the "prize" of the Upstarts contest to accumulate points by killing people (the willing services of the losing contestants). When Cortez complains that the Upstarts are becoming to large a group, the Gamesmaster declares that the candidate Fitzroy has been secretly grooming will be the last member of the group. This is a reference to Sienna Blaze (who also already appeared in, that's right, Stryfe's Strike File), who will make her first proper appearance in X-Men Unlimited #1. Continuing to tease the return of Magneto, this issue reveals that Asteroid M has crashed to earth in the wake of the attack on it in X-Men #3. The fact that it landed mostly intact suggests someone (possibly with magnetic powers) must have helped guide it to the ground. Additionally, inside the asteroid, bodies of the previous Acolytes are found, but Magneto's is missing, with only his shell-like armor in place. Forge, making his first appearance since leaving the X-Men in issue #290, is on hand to help investigate the Asteroid M wreckage on behalf Henry Gyrich. 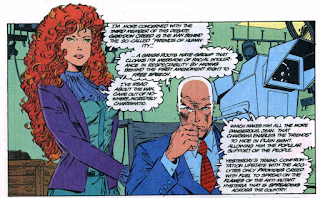 This issue marks the beginning of an effort to humanize Senator Kelly (who, prior to last issue, was last seen ranting and raving about mutants at the end of issue #281). He spends much of the debate agreeing with Xavier, at least in general, and refuses to take the bait when Creed brings up the death of his wife (Sharon Kelly, who died during Master Mold's attack in issue #246). 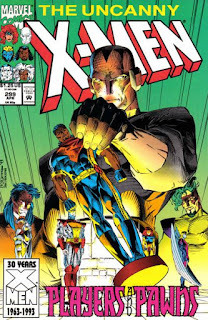 Remember the Mutant Registration Act, the piece of legislation which required mutants to register with the government, which at least in part informed the events of "Fall of the Mutants" and was used as promotional contest prior to the beginning of that story, then was quietly forgotten? This issue establishes that, ultimately, the government declined to fully enact it. 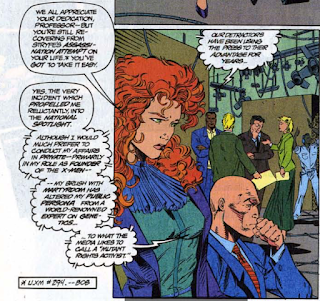 Watching the debate at Harry's Hideaway, Bishop notices a waitress who seems familiar to him; she will eventually be named Pamela Greenwood, and after that, she will turn out to be Fatale, an agent of the Dark Beast who will first appear after "Age of Apocalypse" and will be retroactively established as being the waitress here (at the time, Lobdell had no definitive plans for the waitress, and just threw her in here as a mystery to be developed later). Similarly, as the debate ends, Jean is shocked to discover that one of Senator Kelly's aides is a telepathic mutant. He will later be established as Noah DuBois, an agent of the interdimensional law firm Landau, Luckman and Lake, appearing in some later issues of Wolverine and Deadpool's solo series. Obviously, this issue takes place after X-Men #19, since Colossus and Illyana are back at the mansion (and Iceman is at Harry's Hideaway). Xavier notes that, in the wake of Stryfe's assassination attempt at the start of "X-Cutioner's Song", he has gone from being a noted if reclusive genetics expert who runs a private school to a being considered a mutant rights activist. 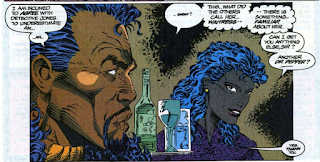 Back in the mansion following the events of the Soul Skinner story, Illyana, somewhat ominously, is heard coughing before a sweet moment between her and her brother. Charlotte Jones is hanging out with the X-Men at Harry's Hideaway as they watch Xavier's debate. 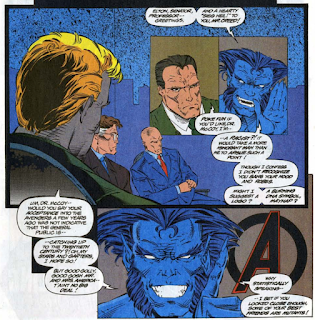 Beast, who is most famous in the Marvel Universe for being an Avenger, appears on the debate show as well; whether intentional on Lobdell's part or not, he is presented as being gregarious and funny, which matches how he was often presented while on the Avengers. 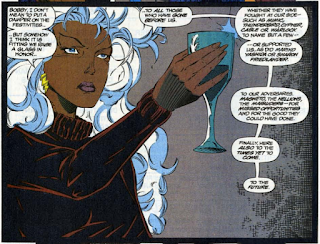 Storm proposes a toast to those the X-Men have lost, naming a few (including Cable), then adding "to name but a few". But, she lists pretty much every X-character to have died at that point. The issue ends with Xavier and the X-Men (the Gold team plus Cyclops and Wolverine) departing for France, the purported location of the Acolytes new base, setting up next issue. 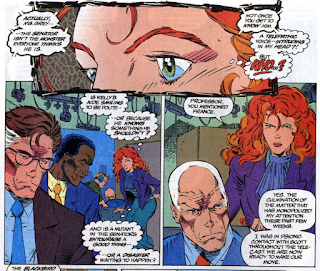 Upon seeing Xavier and Kelly talking cordially to one another, Jean declares, "welcome to the 90s". Archangel once again chides the Acolytes for their response upon learning Teddy has Downs Syndrome, saying diversity should be celebrated. 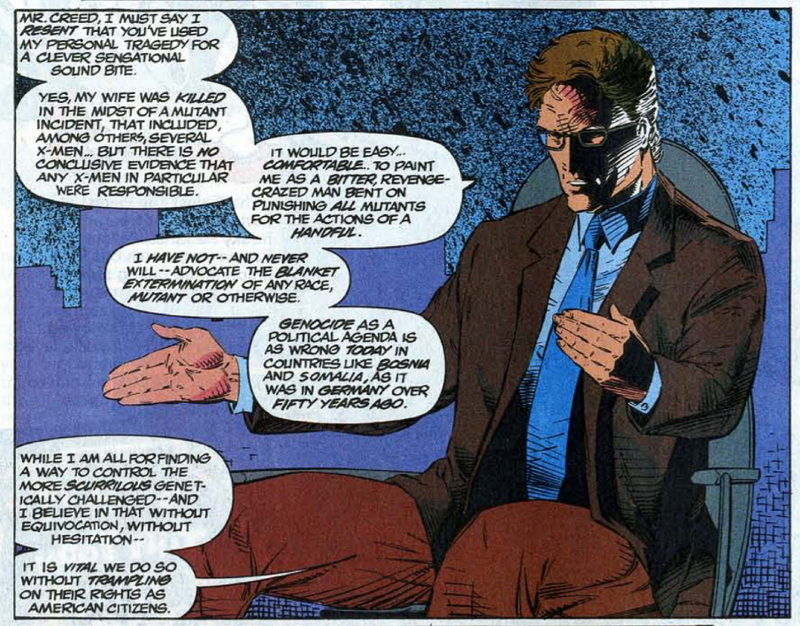 Xavier points out that the vast majority of mutants live quiet, peaceful lives, afraid they'll be exposed and confronted with the kind of hate Creed is peddling. 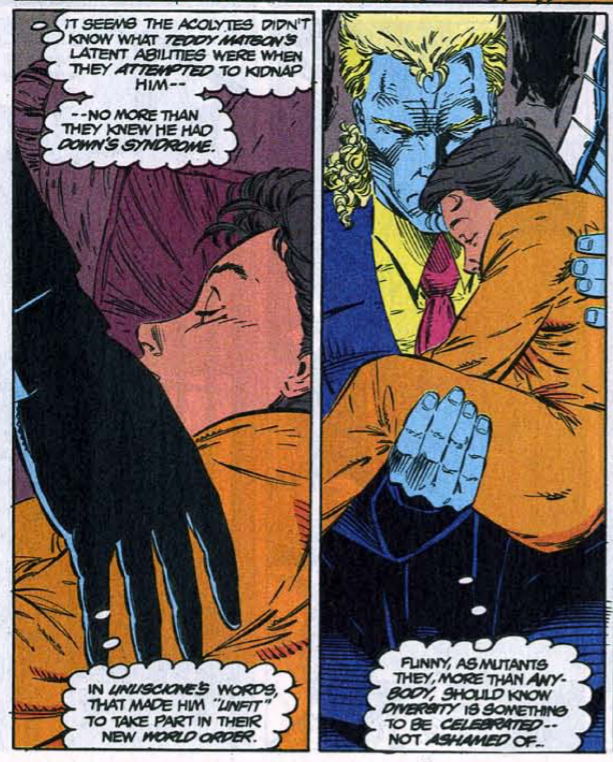 Xavier also points out (and Kelly agrees) that one need not be a mutant (or a member of any other marginalized group) to be sympathetic and supportive of that group's plight. Like the previous issue, this one manages to cover a lot of ground in and around a central, relatively self-contained plot (here, the televised debate between Senator Kelly, Xavier, Graydon Creed and Beast). 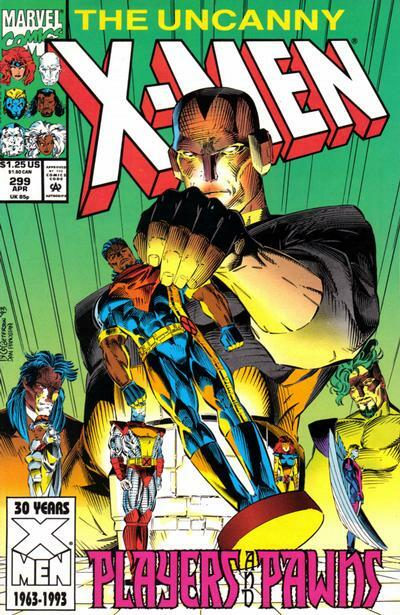 Around that narrative spine, Lobdell continues to tease the return of Magneto via the landfall of Asteroid M and the reveal of Magneto's missing body, begins shifting Senator Kelly's politics to be more moderate, introduces Graydon Creed and the Friends of Humanity, and, in true Lobdellian fashion, tosses out a couple of mystery characters to be dealt with later (Kelly's telepathic aide and the waitress Bishop recognizes). 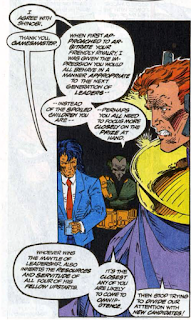 Most interestingly, he also resurrects the Upstarts plotline, Given it was introduced as the key plotline of the future Image founders, and was designed, in part, to push aside older, more established villains, it would have been easy to simply ignore it and let it die on the vine in the wake of the Image Exodus, but Lobdell brings it back here, establishing Creed and Cortez as members, further teasing the debut of Sienna Blaze, and offering his own take on the point of the whole thing (something Lee and company never really managed to do definitively). Along with everything else going on in the next few issues, Lobdell continue to play with the Upstarts, before handing them off to Nicieza to put them to bed for good. Bring them back is a curious decision, but the ultimate closure is nevertheless appreciated. Tomorrow, we say goodbye to Peter David in X-Factor #89. Friday, we meet Epsilon Red in Wolverine #67. Next week, X-Men #19. Okay, I'll buy Storm toasting the Hellions and even Magneto, but the Marauders? Nope, calling BS on that one. Rough-edged kids and even misguided extremists are one thing, but sociopathic assassins who made a living slaughtering innocents, including the people Storm herself was personally responsible for? 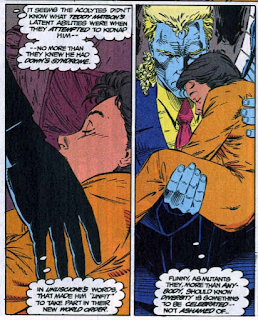 Hell, the reason they're dead is that the X-Men personally killed them all. I know it's just a throwaway line (and it's still a good issue), but man does toasting the Marauders ring false. Yeah, both the inclusion of the Maruaders and the exclusion of Maddie are curious and don't make much sense. "she lists pretty much every X-character to have died at that point." Except Maddie. She's his own great-grandma, and he'll end up dating her for a short while under the assumed name of Calvin Klein. She's fairy and needs to be returned to Asgard. That's quite a cheap out they took with Graydon Creed from the get-go, by making him an Upstart villain. 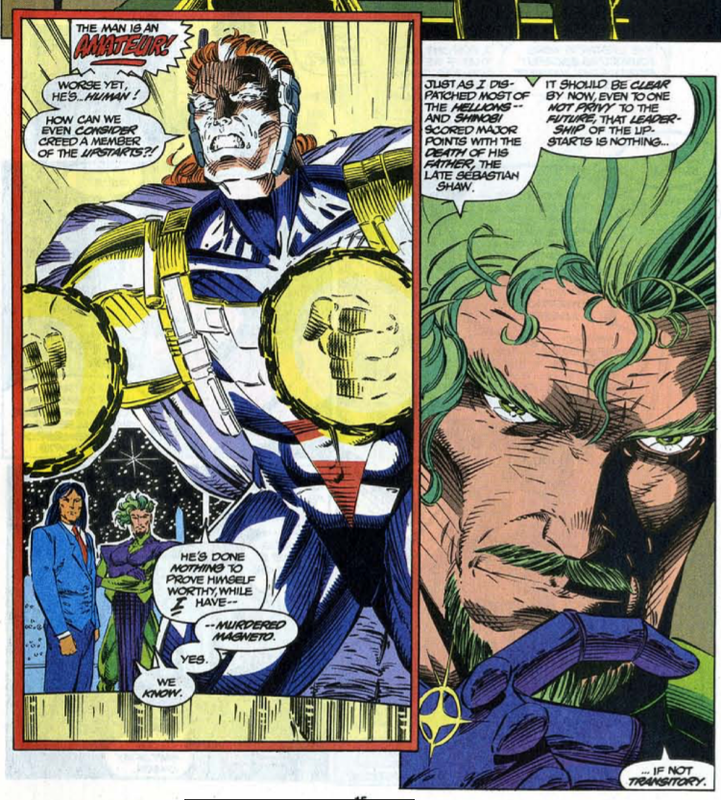 It's pretty needless to juxtapose his supposed extremist ideology there next to that of Xavier's, when he's effectively discredited two pages later by showing him to be a total phony. It's like setting your strawman on fire just to be on the safe side. I'm not sure it's entirely disingenuous for Creed to be part of the Upstarts. I'm pretty sure later stories make it clear he doesn't like Shinobi, Fitzroy, etc., and sees his alliance with them as a means to an end. Inasmuch as it is an alliance, since the whole thing is built around competition anyway. It’s a little (?) weird to have Peter and Illyana back at the mansion before the Adjectiveless story is done. That’ll happen in a shared universe sometimes but when it’s a considerable spoiler it’s hard to excuse. I confirmed at Mike’s Amazing World that this issue came out two weeks before X-Men #19. Gyrich has like 18 belt loops on that pair of shorts. Just what the hell are the Upstarts?!? They’re not all mutants (unless Creed is secretly a mutant, but if he is the others don’t know it) and they’re not all young guys born into positions of power as it seemed before. Did the Gamesmaster bring them all together? Did they all meet and go to him with the idea of, I guess, determining who among them was most fit to have the others work for him? That… didn’t seem confirmed on the page, at least the way I read it. I hear you that he’s established as such later; in this issue, though, Jean couldn’t pinpoint the source of the voice she felt, merely wondering if it was that guy. How is it that neither Creed nor the Nightline staff has done such basic background work as consulting Hank’s c.v. to find he was a student at Xavier’s school? That’s a great band name right there. Blam -- "How is it that neither Creed nor the Nightline staff has done such basic background work as consulting Hank’s c.v. to find he was a student at Xavier’s school?" I've wondered about this myself on occasion, with regards to both Beast and Angel (both publicly known mutant superheroes). I can only think that Xavier's files are not available for public consumption or something. They were probably sealed by good ol' Fred Duncan. Works for me. I guess it makes more sense than all the X-Men’s government files being wiped at the Pentagon, never mentioned (in-series) anymore, since that wouldn’t apply to public records. Hank and Warren both being very public figures, though, and Hank in particular getting a post-graduate job at the likes of the Brand Corporation when his mutant identity wasn’t yet public knowledge, would sure seem to be ripe for exposure of Xavier’s school down the line by anyone adding two plus two even if the frequent appearance of Xavier with his students in public and their frequent usage of their powers in civilian togs resulted in mind-wipes of the general populace every time. It's really the worst kept secret; Xavier was beaten and tried to be assassinated already in UXM #190+ for being a mutant himself, and Phil is suspicious of Kitty in #196 for that reason. 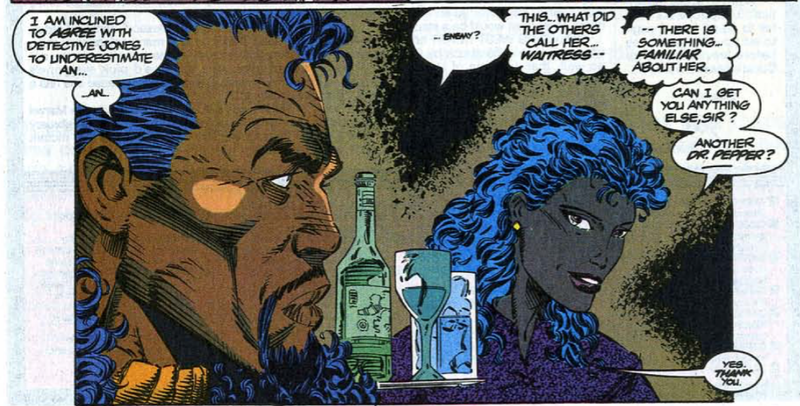 The Hellfire Club was onto them before being introduced (possibly because of Mastermind, though). 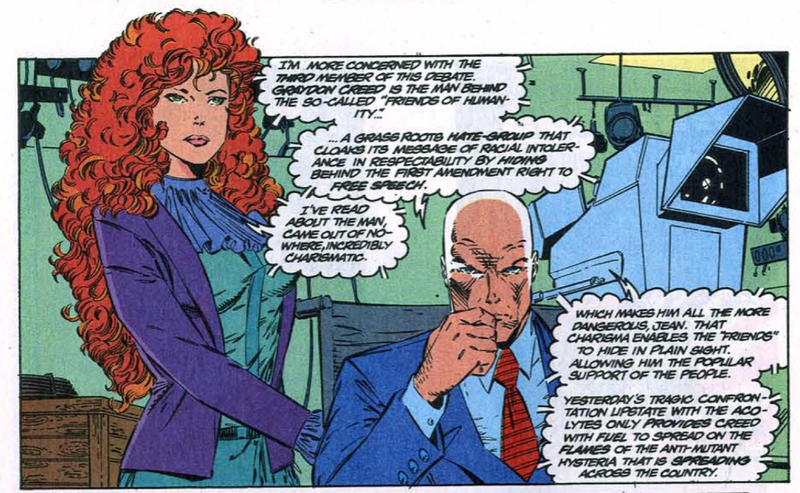 Mystique has known obviously, and the government possibly ever since the Freedom Force shenanigans, at latest. Beast though is hard to connect because the public knows him only as the blue fur version. The other McCoy back in the day probably was a different guy with same name. 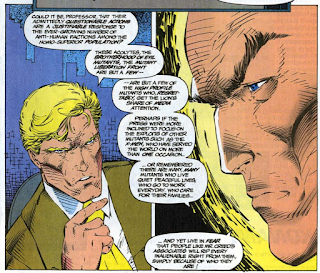 Actually the plausiblest explanation is that "Beast" of the Avengers is yet another reinvention of himself by Dr. Henry Pym, who is just trying to be coy with his laughable choice of pseudonym. Really, how many genius biochemists named Hank they expect us to believe they have? 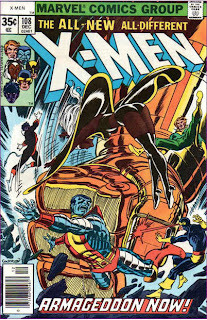 I confirmed at Mike’s Amazing World that this issue came out two weeks before X-Men #19. I'm glad you confirmed that; I meant to. Just what the hell are the Upstarts?!? If only Cyclops had trademarked the phrase “Wolverine insisted on joining us” in 1993 he’d be a wealthy, wealthy man. I'm laughing out loud at this. "I'm comin' along" Wolverine of UXM #109 fame disputes claim. Other than that, *hirhn*. So much in this issue I never realized and/or caught previously! I forgot this was the first appearance of the mystery waitress. I never caught this was the first real appearance of Graydon Creed. I did not know until today that Kelly's aide would become Noah from DEADPOOL. 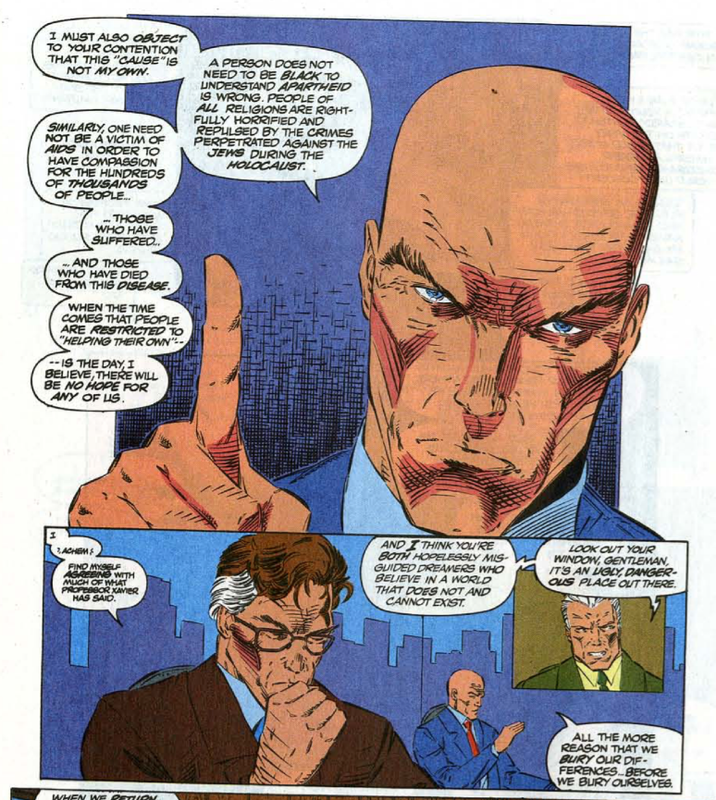 And it never really occurred to me until now that Professor X really was fairly reclusive up to this point (or really, up to the start of "X-Cutioner's Song"). 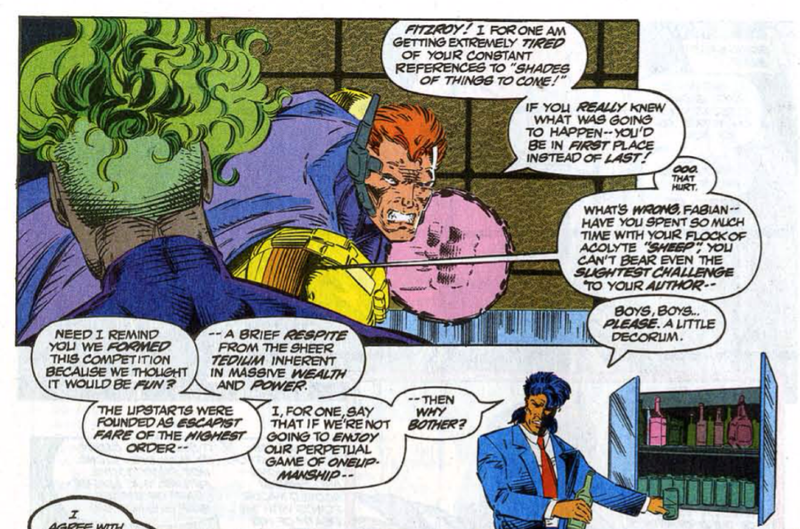 Lobdell seemed to like the idea of him being more of a noted media personality, which is how I tend to think of him in general these days. Also, I've always loved that eerie image of Magneto's empty costume. A nice bit of work on the part of Brandon Peterson! Though, that said, overall I'm not sure he's the best choice for what is mostly (literally) a "talking heads" issue. +1 on the empty Magneto shell. It's one of those images that saty with you, and I've always wondered how Chrome did with Magneto's unprotected, helmetless head (or at least the open bits that show face, in case Magneto appropriately went for his villain helmet off-panel after what we saw on X-MEN #3). Yeah, it wasn't until re-reading this for this review that the whole idea of a shift occurring in which Xavier became a noted activist really jumped out at me. It was just something I'd always assumed had always been in place. Nothing quite says 1993 like those jawlines on all the male characters. Didn't even need to look at the credits to see who inked this issue. Give Peterson a traditional inker and his stuff is pretty good. Give him Panosian and you're cruising towards Image territory. It's worth noting, though, that this style was so accepted then that I barely blinked at it. Was still delighted when Romita Jr. came back, though. I'm glad someone brought up Brandon Peterson. Go look at the shot of Longshot jump-stabbing mojo from X-Men #10. I'm almost positive that's Peterson ghosting for Lee. Does anyone else see it? Am I crazy? X-MEN #11, you mean. The blade was so twisted that I had to go to X-MEN ANNUAL #10 and see Arthur Adams Nightcrawler do it right. Yes, I menat #11. I had a derp moment. By the last few issues of Lee's run, you get the vibe that he was letting the inker do a lot of the work, and at times ghost a panel here and there. I'm sure lateness was an issue by this point. Oh, and thanks for bringing up Annual #10. I'm going to pull it out now and read it. I got Art Adams to sign my Annual #9 and Mojo Mayhem at N.O. comic con this year, and it was like meeting Michael Jordan for me (well, almost). "Remember the Mutant Registration Act, the piece of legislation which required mutants to register with the government, which at least in part informed the events of "Fall of the Mutants" and was used as promotional contest prior to the beginning of that story, then was quietly forgotten? This issue establishes that, ultimately, the government declined to fully enact it." Wow. I had no idea this was ever made explicit in any issue. Very cool. There was the Claremont-written SOLO AVENGERS #14 though, where Jennifer Walters argues against the "newly-enacted Mutant Registration Act" on behalf of her client. Technically what Xavier says here is that the leaders of the country "declined to implement" it, so apparently the Act was legally in force, but didn't see any large-scale factual execution before being rolled back, either de jure or de facto. Kind of cool if She-Hulk's case did that. Oh, and also ... I had quit the series before this issue came out so I missed Graydon Creed's introduction to the continuity. 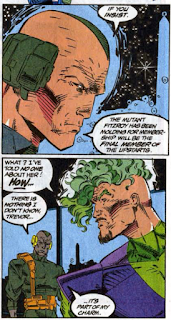 But I had the Jim Lee trading-card set, which lists Graydon as a member of the Upstarts.